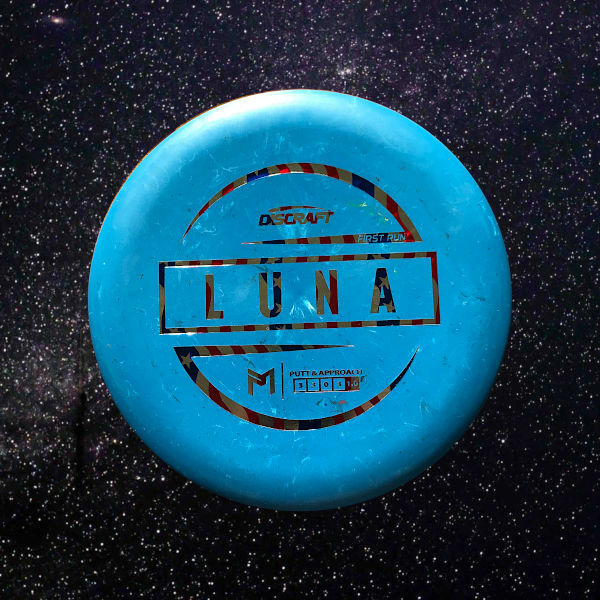 The first disc Paul McBeth has developed in conjunction with Discraft is a putter – the Luna. This putter is seriously out of this world! Here’s Paul talking about the Luna. Learn how it got its name, design, etc. And here is the teaser video Discraft put out a few months before release day. 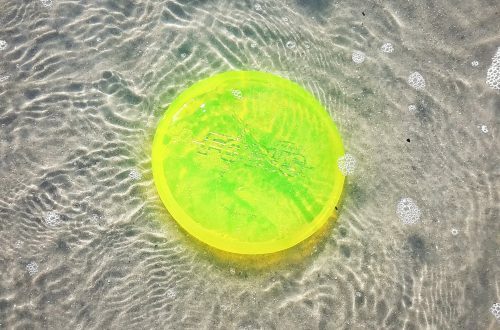 It is my understanding that the Luna is Paul’s disc, molded in conjunction with Discraft in some sort of partnership. You’ll see more discs coming out under this line as well, including the highly anticipated Kong. If you’ve ever picked up an Innova Aviar or a Discmania P2, you’ll have a pretty good idea of the shape of the Luna, though it feels like the rim is thicker and the profile is slightly more shallow. It isn’t labeled as such, but this plastic blend feels a lot like the Crazy Tuff Jawbreaker plastic Discraft has used somewhat sparingly. The original prototype plastic contained a rubber blend that was noticeably bumpy to the touch but the production run doesn’t have that feature. Rumor is the supplier for the rubber blend is no longer able to produce the material – that might just be for the best. 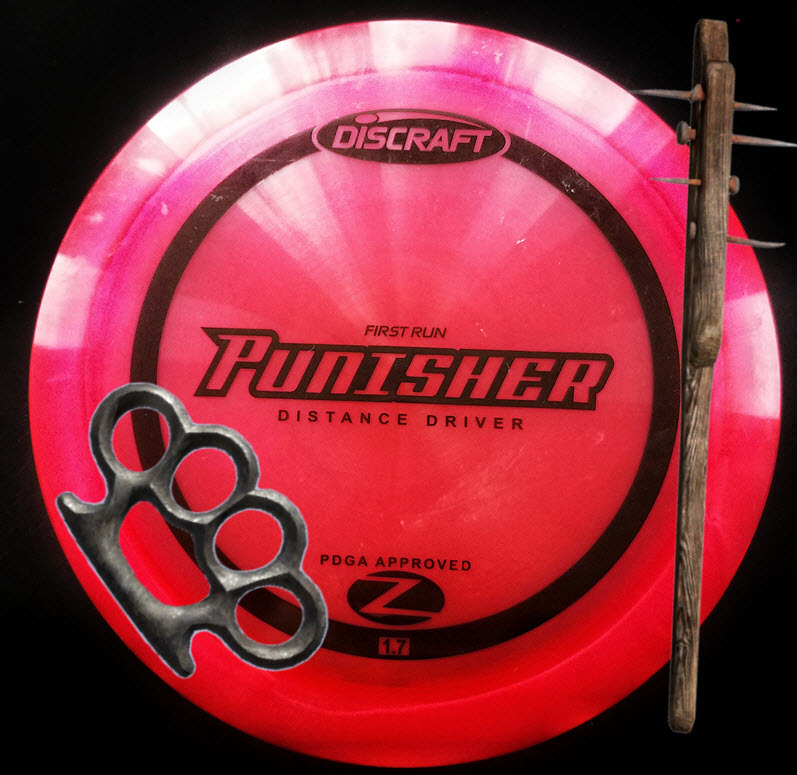 Many disc golfers experienced several bounce-outs with the old prototype. Chris initially hated the feel, mostly because it reminded him of an old Quest AT putter that he isn’t too fond of, but sheeplishly admitted that it felt fine after the overcoat wore down. Note that Discraft changed the flight numbers from 3, 4, 0, 2 on the Prototype Luna to 3, 3, 0, 3. I agree that this is a lower glide putter, however the 3 fade is certainly not normalized with the rest of the disc golf numbers. This is nowhere near the fade of an Innova Aviar X3, Gateway Chief OS, or Discraft’s Zone. I’d put it more along the lines of 3, 3, -.5, 1 but keep reading to learn why. The Luna may be the perfect putter. If you don’t believe me, Jomez Productions has some evidence. If you still don’t agree, go ahead and watch the entire Throw Down the Mountain tournament. Seriously though, I really like putting with the Luna. It feels great and releases very well. The Jawbreaker plastic is one of my favorites, especially after it breaks in and gets a tacky feel. I have a lot of confidence putting in the circle with the Luna, but I feel that can be gained with repetition. Where this putter really shines is the longer putts. I have made a lot of putts beyond 50′, including two jump putts that were nearly 70′. It really is unreal how well Discraft’s new design has fit with my putting style. On shorter touch shots or approach shots, the Luna offers a straight flight path with low enough glide to feel comfortable trying to make the longer shot. I’ve had a lot of fun parking approach shots by playing with the hyzer angles based on distance. It is remarkable how easy it is to manipulate release angles to achieve a straight flight. On my first evening with the first run Luna I stuffed 4 shots in from 90′ – 100′ – maybe it was just a lucky night. Driving with the Luna provided the most surprise. As previously mentioned, the flight numbers are just wrong. I don’t throw crazy far and I watch the Luna slightly turn over off the tee and fade back to center. Think of the flight you’d expect out of a Buzzz and you’re on the right track. If you can control harder throws with a putter then you should be able to find that the Luna offers a late turn that settles gently. I haven’t had any turn and burn drives with it, but I certainly can power up and get a Comet-like flight if I need to, albeit shorter in distance. Discraft Roach: The Roach flies similarly and despite the flight numbers the Roach seems less understable and has more glide. Dynamic Discs Judge: The Judge, otherwise known as my favorite putter for several years, has more glide and a little more fade, especially when putting. Innova McPro (Tour Series) Aviar: I’m sure this is the comparison everyone expected to see. 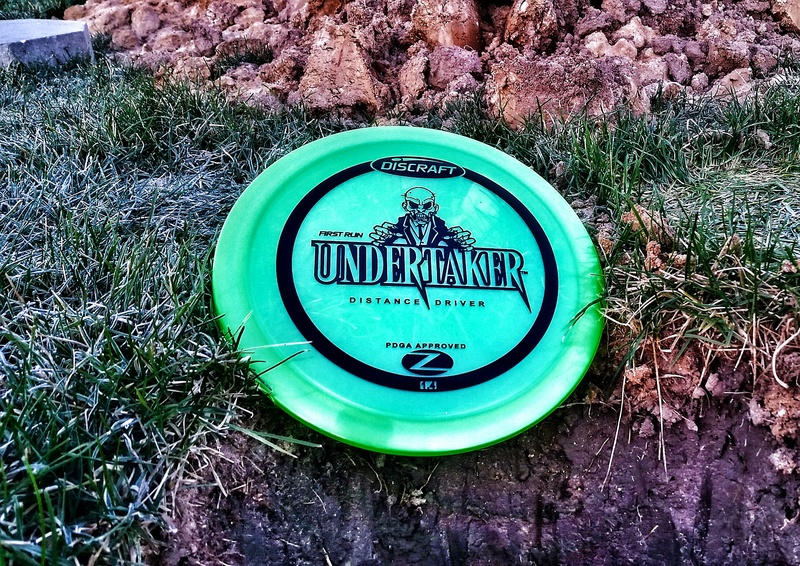 It’s not like the Innova plastic blend was originally named for the player who helped create this mold – oh wait. I wanted to like the McPro Aviar but the plastic was always too slippery for my putting style and it fades just a little more than I prefer. Not to mention the plastic gets really firm in the winter and clanks off the chains or rolls far away (or cracks). Ok Judge. We’ve been together a while, through thick and thin brush. We got through that fling with the Shield, the longer affair with the Deputy, and of course neither of us will forget those days with the Myth. But this feels different. I’m really into this Luna, so maybe, just maybe, it’s time to say goodbye. It’s not you it’s me. We can still be friends, and in reality I’m just not good enough for you anyway. I am still baffled that a disc that putts so straight and flies fairly straight is labeled with a 3 fade. I guess that’s why you have to throw them all (or read our experiences). I’m not planning on putting the Luna down for quite a while. I have made more long putts since the prototype came out than I made all of last season! I’ll reserve final judgement until later this season, but don’t be surprised if this putter ends up on our list of best disc golf putters. Have I convinced you to try one yet? Find your Luna here! Finally a quality review! I find the first runs to be much tackier than the proto run. Definitely not a 0, 3… The proto flew like a -.5, 1, and these first runs are more like 0, 1… I love throwing this first run, not huge on putting with it. What I’m surprised to see is that there hasn’t been any comparison to the DD Warden, at least in my eyes they are nearly the same. Thanks Andy. That first run plastic feels great. We held off on our review until the first run came out just in case the updated plastic changed the flight. We’d definitely agree that the Luna and the Dynamic Discs Warden are very similar, especially when we compare longer distances. I think the Luna has a little less glide up around the basket. I meant “finally a quality review” as in the entire dg community. I just found this site and look forward to returning for more reviews. I agree, the wardens have a bit more glide, but I’m finding I have better control with the Luna when throwing, and I actually putt wardens. If a Classic blend Luna existed though, oh boy. Did they tweak the design at all to try to make it a little more stable (from 2 to 3) or did they leave it the same and just change the numbers? Hi Bill – they didn’t change the mold, just the numbers.